Thank you for making us aware of your experience. We want to help, but are unable to find your account with the information given. Please contact customersupport@empiretoday.com, so we can address your concerns. I was in a class of 5 at empire for training. Every salesmen is gone. we all lasted 2 weeks. you make no $$. they work you to death. you cannot possibly make all the appts. they start w a high price then you are to call a salesmgr to get a lower price and sell the customer right there. If you need flooring do some work. all the installers quit. all the salesmen quit turnover is about 98%. cancellation rates after a sale is over 50%. 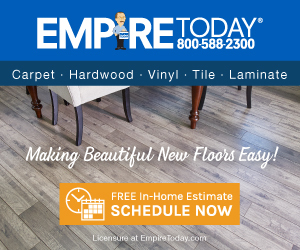 you can get the same flooring much cheaper any where. buy it from a local contractor. and have them give you a discount get a old timer contractor. Review #831918 is a subjective opinion of User831918.